Insulated siding, one of the many siding options available to homeowners, is often considered to be a great alternative to many of the other costly siding options. Although many contractors still prefer the traditional vinyl siding, insulated siding can offer a competitive edge as it has a polystyrene foam backing which adds an insulating layer, allowing it to resist dents, cracks and increase its soundproofing qualities. 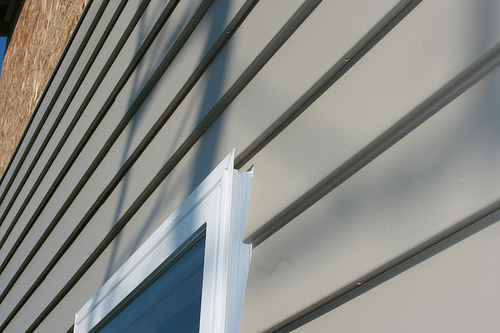 The costs of insulated vinyl siding greatly depends on the manufacturer, the color and the profile being used. For just the materials alone, be prepared to spend $2 to $5 per square foot, but if you want to hire a professional contractor to install it, then the total costs can range from $5 to $10 per square foot, all depending on the size of the home, the home’s layout and the geographical location. Keep in mind this price range could increase by about 20% if you need your existing siding removed. As all jobs are so unique, we highly recommend you check out HomeAdvisor. With this website, you can simply describe your job and licensed contractors will email/contact you with free quotes, saving you the headache of contacting and researching multiple contractors in your area. A member on this Hearth.com forum thread stated he received three quotes for his 2,400 square foot home to replace the existing wood siding. According to this thread, he was quoted anywhere from $13,000 to $24,000 for vinyl siding, but if he wanted to upgraded to insulated vinyl siding, it would increase the costs by as much as $4,000, bringing the square foot average to about $10 per square foot if he were to choose the insulated option. Granted, the contractor would have to remove the existing siding which would affect the cost. What exactly is insulated vinyl siding? Insulated vinyl siding, from afar, will look no different than the traditional vinyl siding as of today. The only key difference here is the layer of expanded polystyrene (EPS) foam insulation which is adhered to the backing and will be derived from a PVC or polyvinyl chloride resin-based material. Because of this foam, manufacturers will charge up to 40 percent more, but do not let this sway you as many homeowners claim they are able to recoup the extra costs since the foam backing helps reduce their energy bills. How long this takes to recover will greatly depend on your climate, how much you spent, the brand and how well it was installed. Experts, from what we read, said homeowners in either an extreme cold or hot climate will benefit the most and will see a payback period in as little as four to six years. If you live in a moderate climate, however, it could take up to 10 to 15 years to see your investment pay off. When shopping for insulated vinyl siding, you will notice a term referred to as the “R-value.” This term simply means its resistance to the heat passing through it, either when it leaves your home or when it enters during the warmer months. With insulated vinyl siding available in various thicknesses, just like other types of siding, the R-value will greatly vary; however, most insulated siding will produce an R-2.0 or greater. To meet the government Energy Star requirements in order to qualify for tax credits, however, the siding must have an R-value of R-3 or greater in climate zones 1-4 or an R-5 or greater in climate zones 5-8. Increases the R-value as all brands are an R-2 or higher. Its impact resistance is much higher when compared to a traditional vinyl siding. Some brands have a unique vapor permeability, which allows the siding to breathe between the siding and the house. This, in turn, can prevent seam problems and gaps due to the shrinkage over time. In some cases, depending on the brand, it can be installed over existing siding, making the install job cheaper in some cases. For an irregular wall or setup, this type of siding can create a solid finished-looking wall. Some sizes can be much larger than what traditional vinyl siding can offer. Many brands have created specifically designed pieces which can fit corners and windows with ease. The sound control is much better in comparison to traditional siding. It’s known to perform better in extreme weather. As compared to most vinyl-based siding, it will require much less maintenance and repairs if it were to become damaged. The insulation foaming will not absorb moisture, preventing mildew and mold. Energy credits are available for homeowners as it can reduce your energy bills by up to 10%. Failing to install the siding properly can lead to warping and/or buckling problems in the future. Pieces can also blow away if it’s not attached securely. A waterproof barrier installed on the exterior of the home is necessary, and failing to install it can lead to water entering home. However, if a waterproof barrier is used, this can create the moisture-free environment mentioned in the pros above. The installation costs, when compared to traditional vinyl siding, is about 40% more on average. If the siding needs to be custom made to match a color and/or design, then the costs can increase even more. Since this type of siding needs to be professionally installed, it can be hard to find a qualified contractor in your area who is able to successfully install it. When choosing one, always make sure the contractor has experience and is licensed and insured.